Last week I had the pleasure of embarking on one of Outdoor Adventures’ many trips. 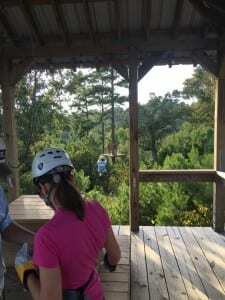 This time we headed down to New York, Texas to try out zip lining. Don’t worry if you’ve never heard of this particular New York, because nobody else has either. As the road narrowed from the dense foliage on either side encroaching into our lane, I wondered if our leaders actually knew where we were going. But sure enough, five miles past the last sign of civilization, the trees parted revealing a gorgeous estate with rolling hills in all directions. I felt as if we had stumbled on a zip liner’s paradise. The family who run this company had their eighty-five year old house transported here as the center, and began setting up a network of lines which connected the hilltops all across the ar ea. In a matter of minutes we were covered head to harness in safety gear and prepped for takeoff. The moment when you step off the platform, your heart drops into your stomach as the zip line takes you on a thrilling ride through trees, over lakes, and on to platforms. Everyone around was all smiles and full of enthusiasm, making the trip all the better. It was a fantastic way to spend my Saturday afternoon, and the free Popsicles at the end topped off the day perfectly.